The lake continues to drop as the corp has been pulling water steadily this week. Currently the lake stands at 1.3 feet over full pool and down nearly a foot from my last report. The rivers are still heavily stained to muddy and mid-lake is stained. The live creeks in the lower lake are stained, and the lower main lake remains clear. The floating debris is virtually gone, but still keep an eye out for random logs and such. 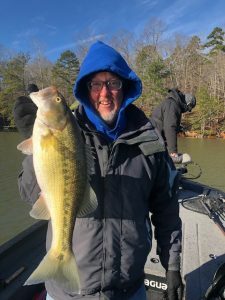 Shallower rocky points with a jig and worm in the mornings and sometimes throughout the day have been our best pattern overall this week. Not a ton of bites, but the ones you get are good ones usually. 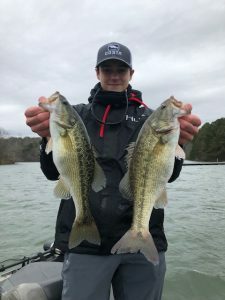 Also we are getting a few on a crankbait on some mornings up on the rock as well as later in the day, particularly on sunny afternoons when there is a breeze. We are also catching some worm and jig fish in the 20-30 foot range, but the presence of rock seems to be a key, and generally, I am dropping to these fish with a shaky head to catch them. The spoon bite as virtually vanished this week. There are plenty of fish out deep but they are scattered for the most part which makes it tough for the spoon. 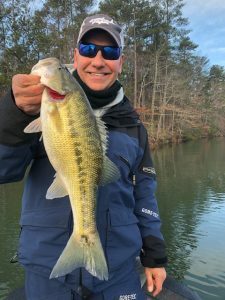 A drop shot will work at times but requires steady patience and an undying will to catch ’em deep without giving up and heading back to the shallow rock. LOL. Which means I am not fishing deep much. LOL. 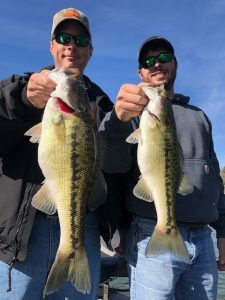 The creek ditches are still holding some fish now in shallower water and we have been catching a few on the SuperSpin down in the ditches on some days, but this pattern has not been as predominant for us as it has been in past years. 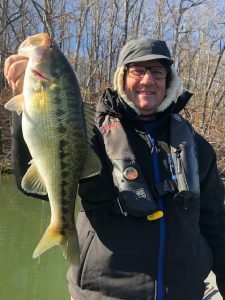 Also, with the cooling water temperatures, look for the jerkbait bite to pick up back in pockets. This hasn’t happened yet, but with the cool down coming this weekend, it could happen fast. 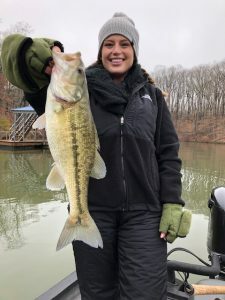 I hope you will make plans to come join me as we soon will be heading into the early pre-spawn bite! 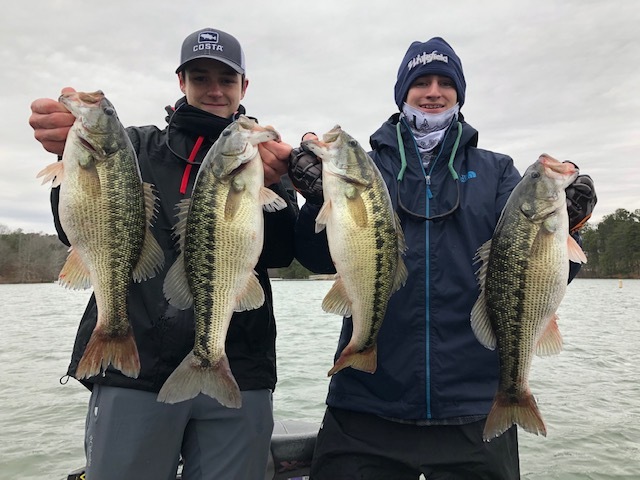 There is some winter fish to be caught, but we will shifting our focus to our early pre-spawners in the coming weeks. I hope the Groundhog allows for an early spring! Here are my open dates for January: 29, 30, 31. Feb: 4, 5, 6, 7, 8(AM), 11, 12, 13, 14, 18, 19, 25, 26, 27, 28. 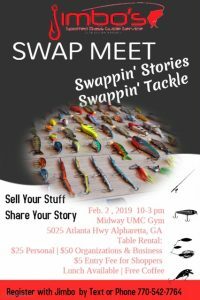 Also, I will be hosting a Fishing Swap Meet on February 2, 2019 at Midway UMC on Atlanta Hwy and Post Road. You can rent a table and sell your tackle or just come and shop. We expect a packed house so let me know ASAP if you would like a table. Contact me directly for details or table rental.